30 Year 7 students got their first taste of Kingsbury Leadership this Tuesday, they spent the morning learning leadership skills with Ms High. They were then joined by 210 Year 4’s from Kingsbury Green, Oliver Goldsmith, Roe Green, Fryent and St Robert Southwell. 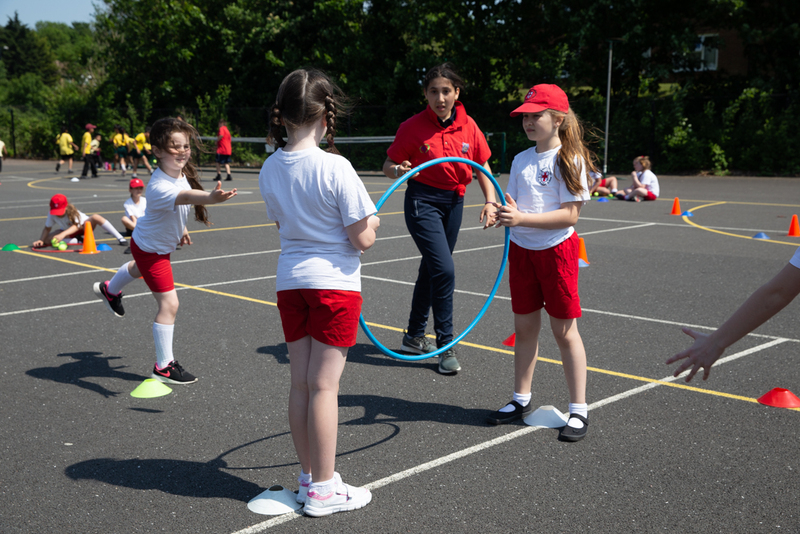 The leaders put on a number of engaging and fun activities, getting the young people active whilst working on their physical literacy. Last week was a memorable week for our Year 11 students. First they were invited to the Year 11 Evening of Achievement which is designed to give KHS an opportunity to recognise the tremendous amount of effort and commitment our Year 11 students have applied to all aspects of school life over the past two years in the Examination Stage. It was a very difficult job for the teachers to decide who to nominate from a year group with so many diligent students, and KHS is fortunate to have such well motivated, trustworthy and courteous students who manage to fulfill their potential. This is only made possible by the continued support of both parents and staff. 140 students were nominated by various faculties, with the awards reflecting the KHS values of PRIDE- Personal Excellence, Respect and Friendship, Inspiration, Determination and Courage and Equality. Musical entertainment was provided by Monica Motealoo on piano, and the evening culminated with the presentation of the Headteacher’s Gold, Silver and Bronze awards for Student of the Year to Shruti Hirani, Eden Behl and Andrei Roman. Thank you also to Atiya Zia, one of our Year 12 photography students for attending the event and taking photos. 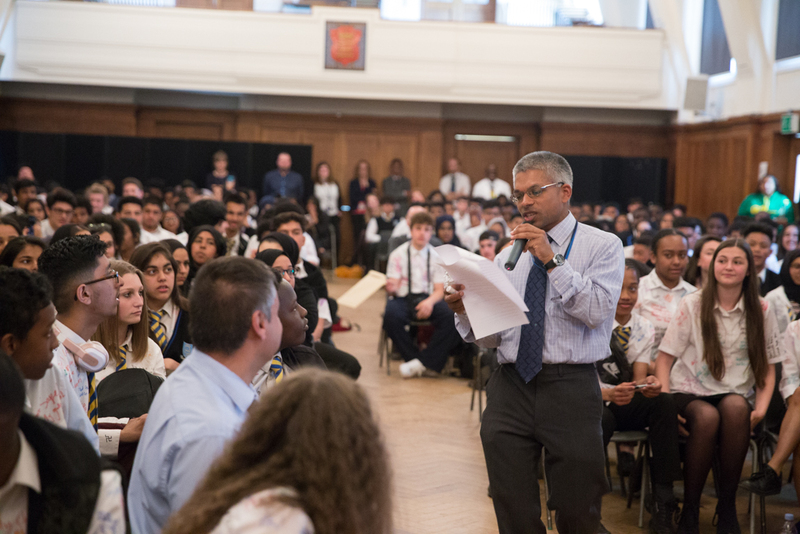 This was followed by the annual Year 11 Leavers Assembly on Friday 11th May which Year 11 students attended before their GCSE examinations commenced. The day started with traditional shirt signings in their classes followed by a the Leavers Assembly in the School Hall. The occasion was filled with a mixture of sentiments as the students were taken through their five years at KHS. Students took to the floor to thank their Form tutors and then after a musical interlude, they were given a send off full of emotion. Special thanks go to Basmah Mohamed for her spoken word reflections on school life, and to Tahaa Doraid for his musical performance. We wish all our Year 11s the very best for their exams and their future. The English Department are pleased to announce that a range of students from Years 7 – 11 that entered the Young Writer’s Poetry Games Writing competition have had their poems published. These talented writers have taken it upon themselves to write about various topics ranging from underlying issues within the community to comedic and joyful poems. KHS held a ceremony to commemorate the students’ hard work with hot chocolate, croissants and a spoken word poetry session. These poems are a true testament to the raw talent, passion and dedication we have to writing at Kingsbury High School. We with them all the success for the future. In April seventeen students from Years 12 and 13 successfully navigated the trials and obstacles of the academic research process by concluding their extended essays for the AQA EPQ, which is essentially a 5,000 word dissertation for A-level students. 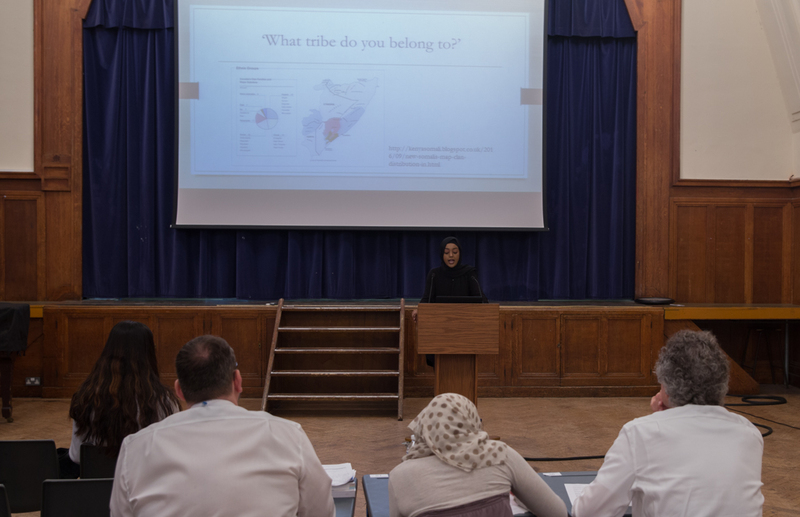 In keeping with the dissertation theme, students have to present their findings to an audience of staff and peers, which is the final assessed part of the qualification. Every year, Mr Windrich keeps a video record of the presentations to assist the examiners and these will be placed on eStream in due course. The point of the projects is to extend learning beyond the A-level specifications and to give students the opportunity to choose their own research topics, thus playing to personal strengths and enthusiasms. Yasmin Warsame (on the reasons why Somalia might be regarded as a failed state). The projects are currently being assessed and will be sent to the AQA Exam Board by 15 May. After that, on Thursday 24th May, Year 9 students will be presenting their shorter academic research projects for a related qualification, the HPQ, from 5pm in Tyler’s and Croft Hall. Please support this wonderful event if you can. For further information about this evening, please contact Ms Ruparelia.